When a mysterious black ooze seeps into the sea and disturbs the Squids’ peaceful kingdom, a scrappy shoal of heroes must fight back. 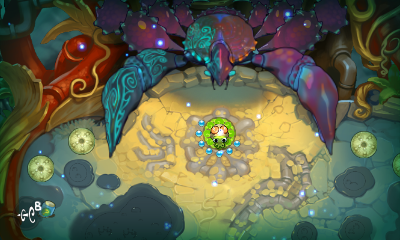 During turn-based combat against ooze-infected crab and shrimp, the Squids’ springy tentacles become their best weapons: stretch them with your finger or the stylus, aim, and release to shoot your Squid toward its target. Four hero classes, stat-boosting helmets, and power-ups add a strategic element to the role-playing gameplay. If you’ve played the Wii U version, this is all the same content as that one in convenient portable form. Unfortunately for reasons I will outline later, I was not able to get very far into the story, but from what I played, the short official summary is pretty spot on. There are 56 regular missions and 35 bonus missions, so there’s a LOT of content and story to play through. The story doesn’t stand out particularly, taking a backseat to the actual gameplay, but it’s enough to lend a purpose to flinging squids. The game is advertised as a turn-based RPG, but there’s very little roleplaying involved, which I found disappointing. It’s very linear with no player choice, which isn’t what I think of when I think about RPGs. The only thing that’s RPG-esque is leveling your characters up. It’s kind of like Diablo in this way – you level up and equip your characters, but have no impact on the story. I dunno about you, but I’m intimidated by this band of squids. The graphics are super colorful and fun to look at – especially the characters you can unlock. 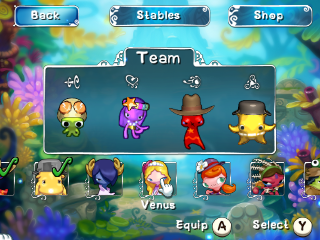 The backgrounds and art are fairly detailed, and there’s a lot of ways to customize how the characters look by way of hats. Sometimes it’s a bit hard to tell which enemy sprite is which, but that’s because the smaller ones are all kind of the same color/build. 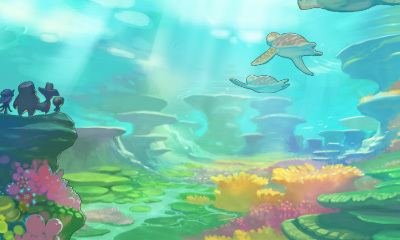 The music is varied and fun, sounding very ocean/underwater-esque, and I never got tired of listening to it. Some parts reminded me of The Little Mermaid soundtrack. There is no voice acting or speech in the game. I really love this loading screen art. The main part of gameplay is flinging squids at enemies. You can use either the stylus or the thumbstick to fling them, and I found that playing the game without the stylus was more comfortable and intuitive. There are four main types of squids: ones that do the most damage being flung, ones that stomp the ground to send enemies flying, sharpshooters, and healers. You don’t start with all these squids, but will unlock them all fairly early on. There are multiple squids of each kind as well, so you can build your party how you see fit. There’s not much difference besides appearance, however; initial stats are different, but that can be remedied by leveling up. 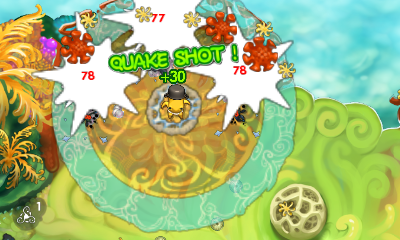 Squids can be leveled up until level 30, and stats can be enhanced with hats. Everything is purchased with pearls that are found throughout the levels (as well as rewards for finishing the levels). You get more rewards for finding the hidden star in a level, finishing with all your squids alive, finishing in a certain number of turns, and just for finishing. You can also go back and replay levels for more pearls, which is a good (if tedious) way to get more pearls. I wish that squids could be leveled up based on experience points vs pearls; I think it would be better if pearls were only for hats and items. As you need to level the squids to higher levels, it becomes more and more expensive, which can be prohibitive. The biggest complaint I have with SQUIDS: Odyssey is the difficulty. There’s no adjustable difficulty levels, and the enemies are very smart and aggressive after the first few levels. It’s also very easy to fling your squid off a level, losing them forever. I found this quite frustrating, and I wish I’d been able to lower the difficulty. SQUIDS Odyssey is a charming game with tons of content, but the non-adjustable difficulty level might put some players off. The Game Bakers do offer an official guide, which might help out a little. I like it enough to keep pushing through, and it’s a good game to play in short bursts. You can get SQUIDS Odyssey on the Nintendo eShop for $14.99. You can also get the game for the Wii U, also on the eShop. Check out the team on Facebook (and Facebook for the game), Twitter, Google+, and the official site.